It’s been a looooong winter. They always are. Long and dark. The darkness is probably the most challenging thing about living in Sweden. But it also makes us appreciate the light. So when the first sun rays hit us we go absolutely nuts. We throw off our jackets, dig up our shades and head to the nearest park bench for a soup lunch under the sun. That is at least what we did last Wednesday. On the first day of spring in Stockholm. We know that lunch on a park bench might sound like a pretty average experience. But sometimes a good old wooden bench, a nice soup, the company of someone you love and a little sunshine is all you need to have a great day. A while back we did a post about roots. Since then, we have actually implemented them a lot more in our meals. 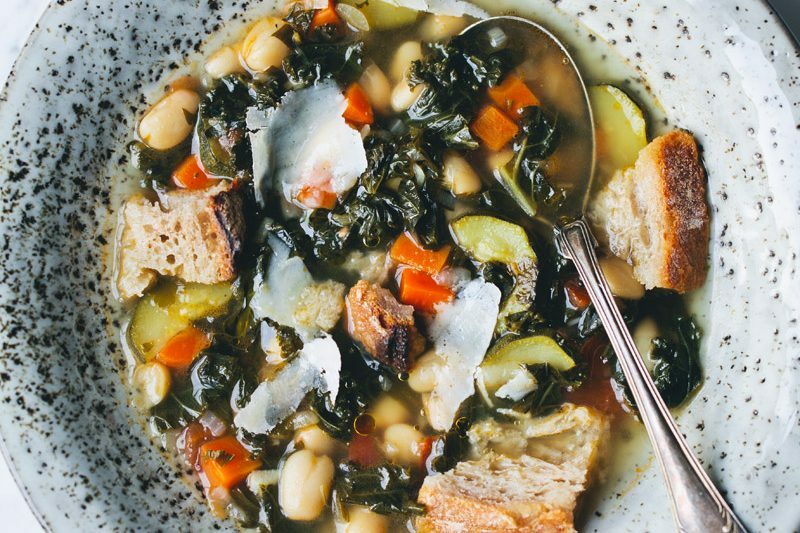 This soup is one of our latest favorites. When bubbling on the stove, hints of flavors from celeriac root, parsnip, sunchoke, lemon, fresh oregano and white wine fills the kitchen. And as you dig in you will immediately be struck by its creaminess, which is enhanced by the white beans. Roots may look wrinkly on the outside, but they are smooth as butter when used in soups. When we were in Copenhagen last weekend we got a batch of these purple potatoes from Luise’s mom. Aren’t they wildly beautiful!? We turned them into crispy oven baked chips, but if you have more suggestions on how to use these small explosions of color we’d love to hear them. That’s it for today. 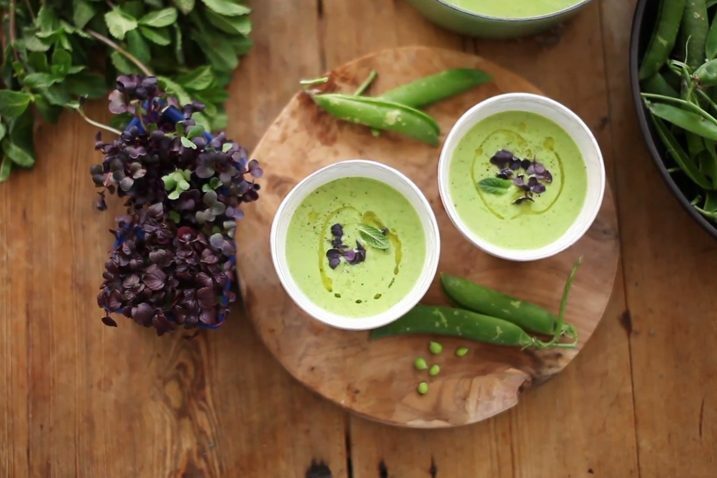 Go make this soup now. But remember to check back with us soon as we have some pretty exciting news coming up in our next post. Preheat the oven to 400F/200°C. Prepare the root veggies: Wash well and cut into large pieces, place on a baking sheet together with onion and garlic. Bake for 45 minutes or until golden and soft inside. 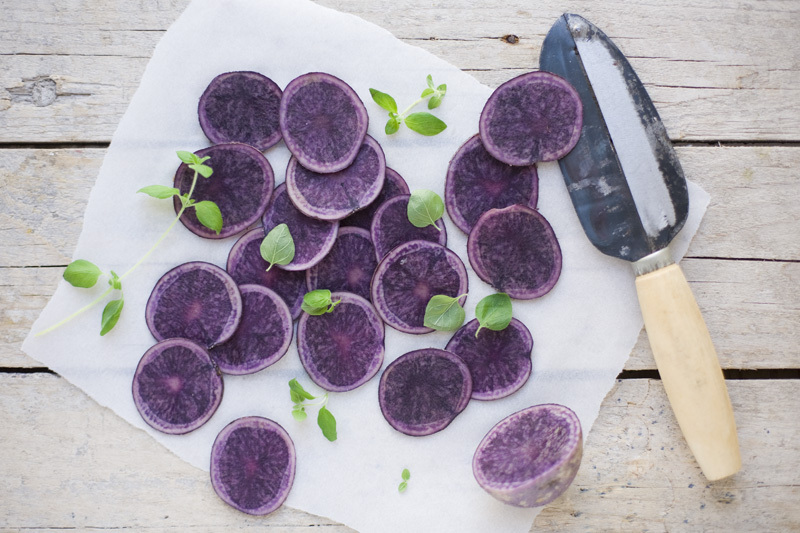 Meanwhile prepare the purple potatoes: Slice the potatoes paper thin by using a mandolin or a sharp knife. Pad them dry with a kitchen towel and place on a parchment covered baking sheet. Bake for about 15 minutes or until lightly brown and the edge lift slightly. Turn them every 5 minutes. Keep an eye on them as they burn easily. When done, remove from oven and sprinkle with salt. 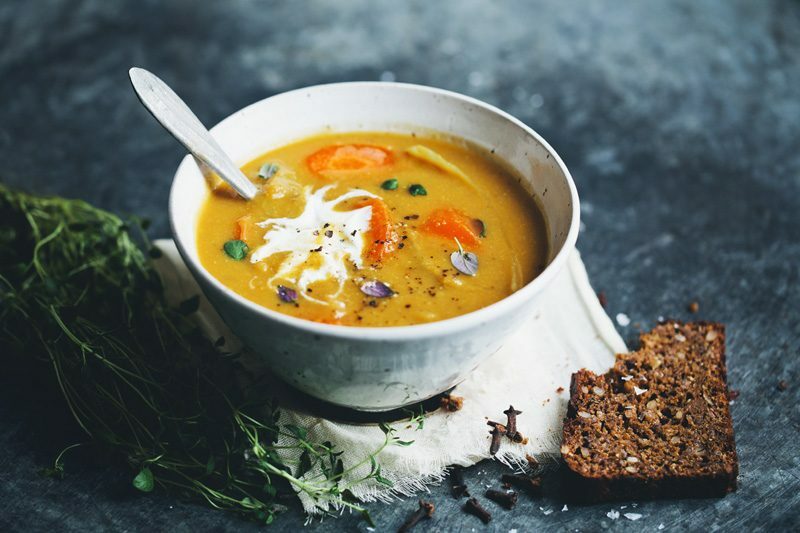 Finishing the soup: Remove the root vegetables from the oven (let cool slightly) and place in food processor or use an immersion blender. Add beans and water (start with 4 cups, add more if needed) and mix until smooth. Pour the soup into a pot, bring to a simmer on medium heat and add white wine, lemon juice and oregano. Bring to a boil and season with salt and pepper. Remove from the stove and stir in the olive oil. Serve in bowls and garnish with your homemade potato chips and fresh herbs. 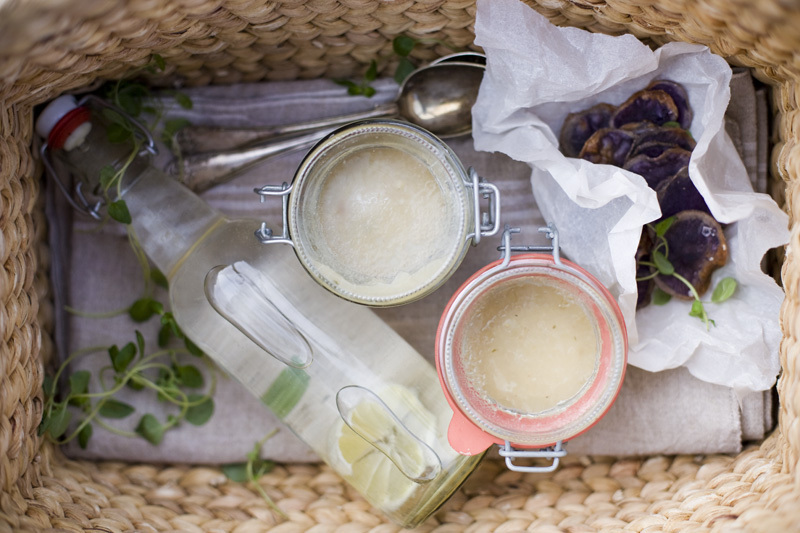 Hi guys, I adore your website - the souldful and healthful food, your family stories, and the peek into life in the north! Purple potatoes are big here in New Zealand. I love them in a salad: steamed potatoes and pumpkin, fresh corn cut off the cob, thinly sliced onions, sliced capsicum, crispy radish, with a tangy, vinegary dressing. Looks like a beautiful day! 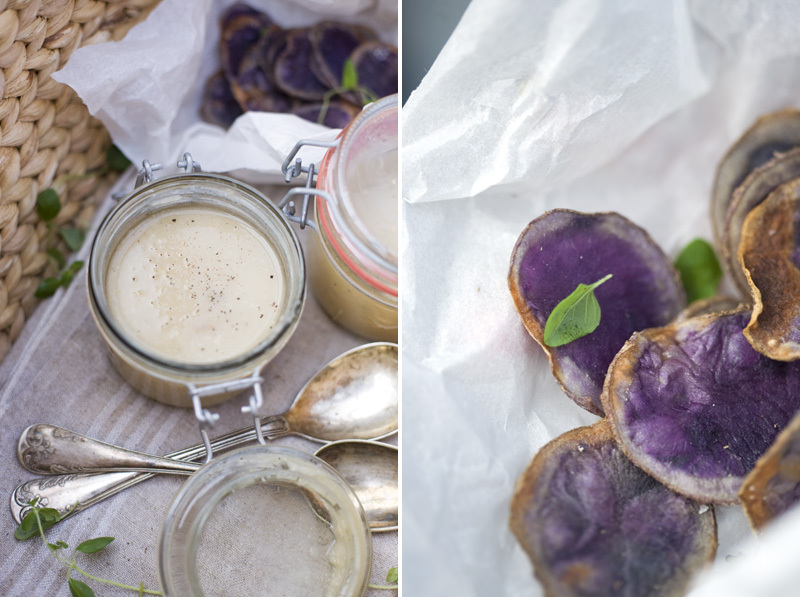 The purple potatoes are gorgeous, and I'm looking forward to our first family picnic this spring. Oh!!! !purple potato chips are so great!!!!! !so yummy as always!!!! Just made the soup! Absolutely amazing:-) the whole family liked it! YUM! Love that you pimp the soup with extra protein! Go beans! This sounds amazing. Will make it next week for sure. And I love that picture of you two! I'm definitely going to be coming back for this big news. Can't wait to hear. Meanwhile, I'll be digging into some root soup and I'll even be making your purple potato chips, which look amazing. Love it! The soup sounds delicious and the photo of the potatoes...wow! This soup looks absolutely delicious! And, I love the addition of the purple potato chips. As soon as I finish up the fennel soup I just made (which shouldn't take long), I'll be making this root and white bean soup. Looking forward to hearing your exciting news! I recently had a celery root soup at a restaurant here in NYC. It had bits of chestnuts and sliced celery for crunch. Delicious! Can't wait to try this recipe it at home. Looks so great...like your pics so much!! Those potatoes are not only super pretty,it's actually really healthy to eat these natural occurring dyes... the more different colors you eat - the better! Love your blog... always such beautiful pictures and content. 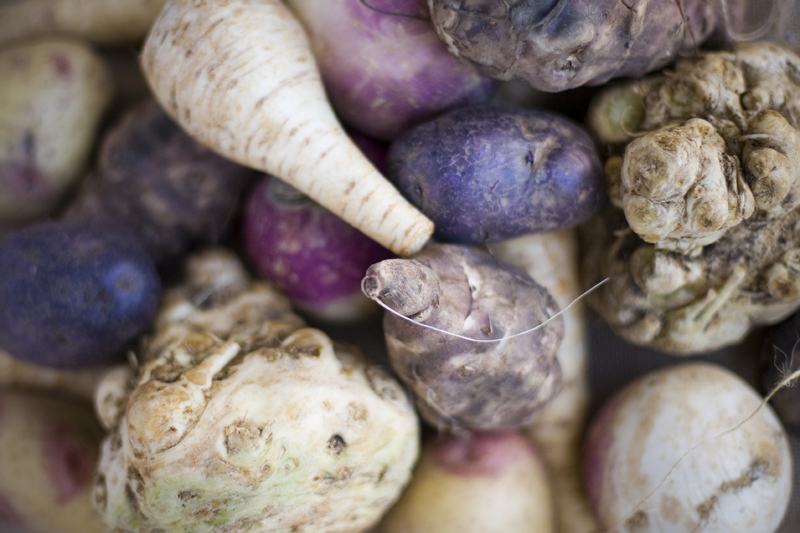 Every time I go to my local market they have these beautiful sunchokes and celery root and the most I could figure out what to do with them was to make a puree. As a root vegetable fanatic, this is going to be perfect. Not to mention my honey has been under the weather, so this will be the perfect thing to heal him :) Welcome to Spring! Hi David and Luise, since I met you in Copenhagen by chance I dared to leave my first comment here! It was really great to meet you I have to say at first. I have already been reading your blog for several months. I baked scones with musli and they actually were very tasty. I have never seen purple potato so I have no clue what to do with it. How does it actually taste? Like a normal potato? 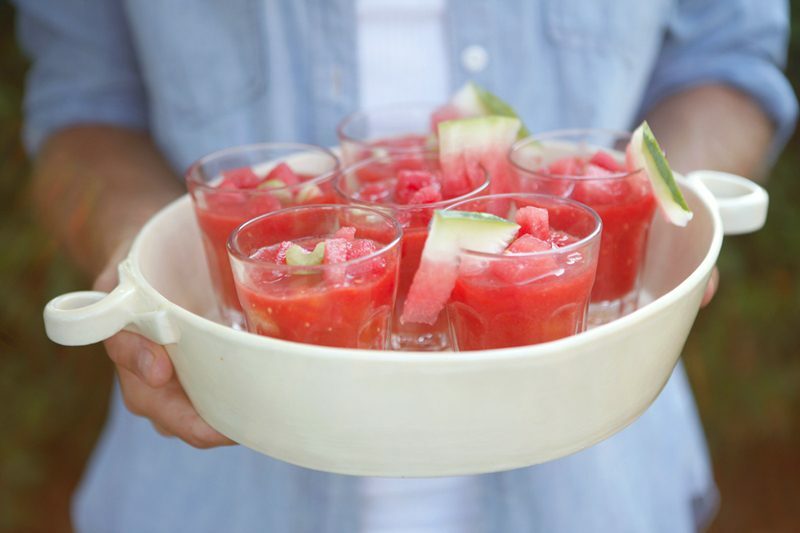 this looks beautiful and sounds tasty! i'm adding it to the weekend menu!i'm always on the lookout for uses for the lowly turnip, a staple from my southern childhood. we only ate them, cooked into huge pots of greens, so this is exciting! 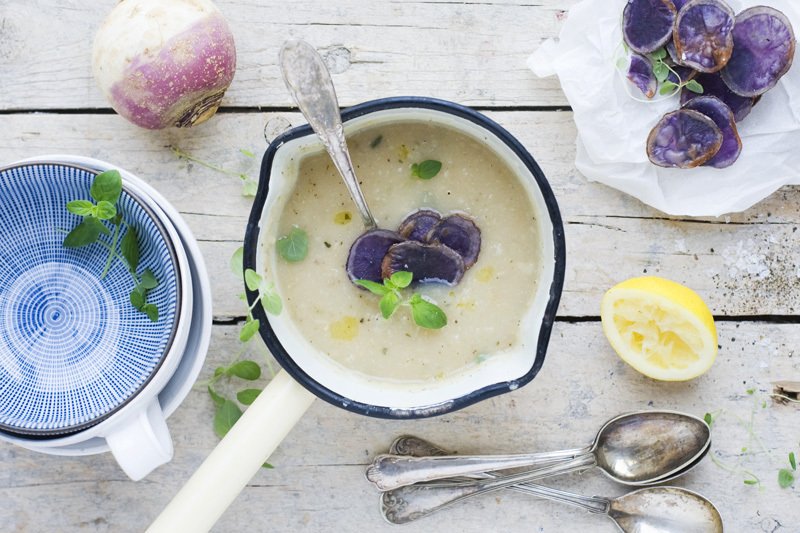 Ah, I do love my roots... and the purple potato chips on top of the soup looks oh so pretty.